After a few days in the northern part of Vietnam, it was time to move south to Ho Chi Minh City. Ho Cho Minh is the city formerly known as Saigon, and is actually still frequently referred to as Saigon by many of the locals. After a flight full of turbulence (which I just love), I arrived in Saigon in the evening and found my way to the taxi stand to get a ride to my hostel. My first impression of the city was that it seemed much more modern than Hanoi. Although, it was somewhat difficult to get a full sense of the city because my taxi driver clearly didn't know where he was going...just what you want when you're a young woman traveling solo. Luckily, he stopped to ask for directions after some time and I made it to the hostel in one piece. Since it was already night by the time I checked in, I stayed put for the night and talked to one of the other people in the room, who just happened to be from Boston! 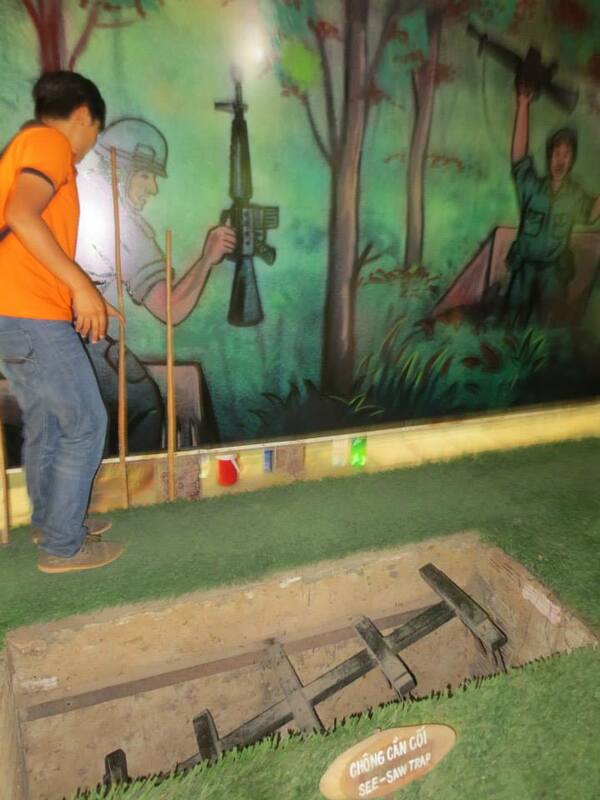 I also arranged my first excursion for my time in southern Vietnam: a day tour of the Cu Chi Tunnels. After a less than ideal night of sleep including blasting AC, I had breakfast at the hostel before making my way to the lobby to wait for my ride for the tour. Once I got picked up we had about a two hour trip to outside of the city to get to the tunnels. On the way there our tour guide (a local) told us about Vietnam's history. Our tour guide told us that in the southern part of Vietnam many people still like America and idealize the idea of the American dream. 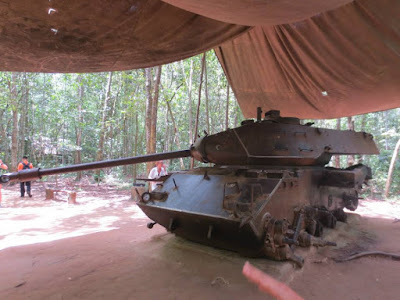 She also told us that a lot of what the locals learn in school about the Vietnam War doesn't quite match up with the things they hear from their parents, and acknowledged that in Vietnam they are only allowed to learn part of the story. She also told us quite honestly about how they cannot write anything bad about the government or they will go on away on a "long vacation"....a nice way of saying they will go to jail. Additionally, the internet is highly censored and when it comes to higher government positions, only people from the north are allowed to fill those spots. Decades later, people with ties to the south are still seen as less loyal than people from the north. 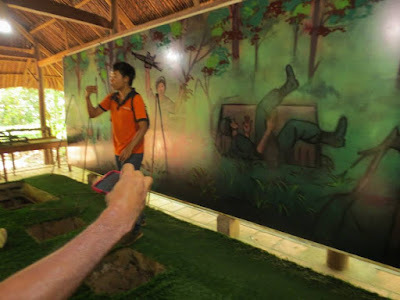 I was really quite surprised that our tour guide spoke so honestly about life in Vietnam considering there still is such a large degree of censorship, but I was quite glad she did because it was really interesting to get that depth of insight from a local. 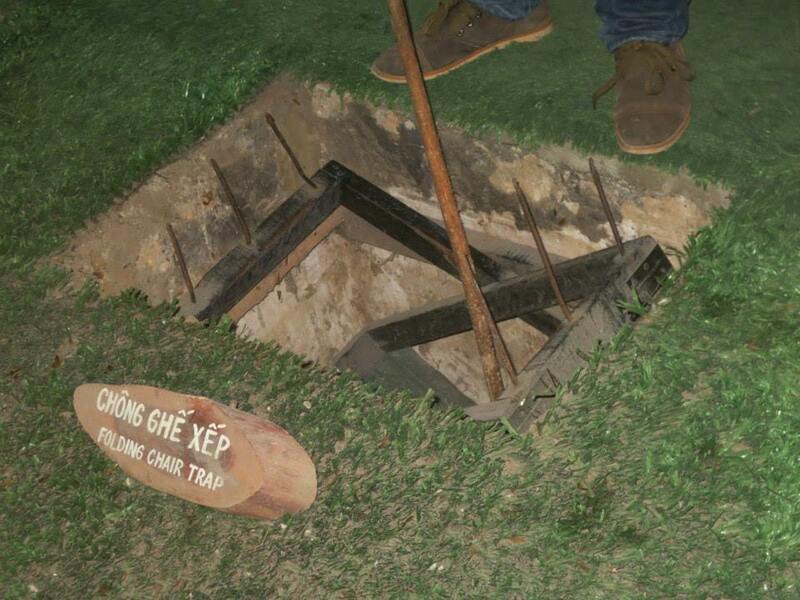 Finally we arrived at the Cu Chi Tunnels, which were used during the Vietnam War by the Viet Cong. These tunnels comprised an elaborate network of paths throughout the country and were vital to the Viet Cong's war strategy. The tunnels were split into three different levels and even though America bombed the area heavily, the tunnels were made of clay and could often withstand the force of the bombs. 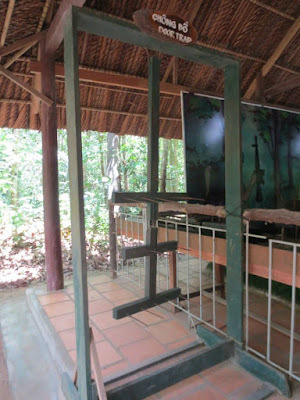 The tunnels were used by the Viet Cong not only for hiding or living in, but also to hold and transport supplies, weapons, and food. The design of the tunnels was so elaborate that even when the Americans tried to pollute the tunnels with gas, it was often ineffective because there were so many turns in the tunnels that it prevented the gas from going all the way through. The entrance to the tunnel is SO small...we had a member of our group try to fit down and it was a very tight squeeze. 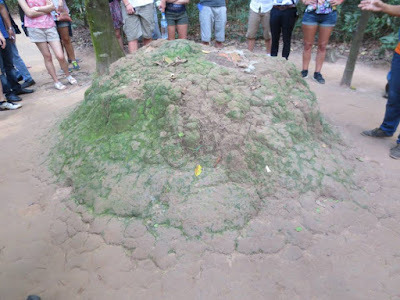 When the top of the tunnel was on and the leaves were put on top it was easy to see why it was so difficult to locate the tunnels. Throughout the tour we saw a number of the traps that the Viet Cong used to capture and kill Americans. It was amazing to see how resourceful the Vietnamese were--the traps were so well hidden that it was easy to see how soldiers would have missed them. Even the entrances to the tunnels were so incredibly small that they were easily camouflaged with the terrain. 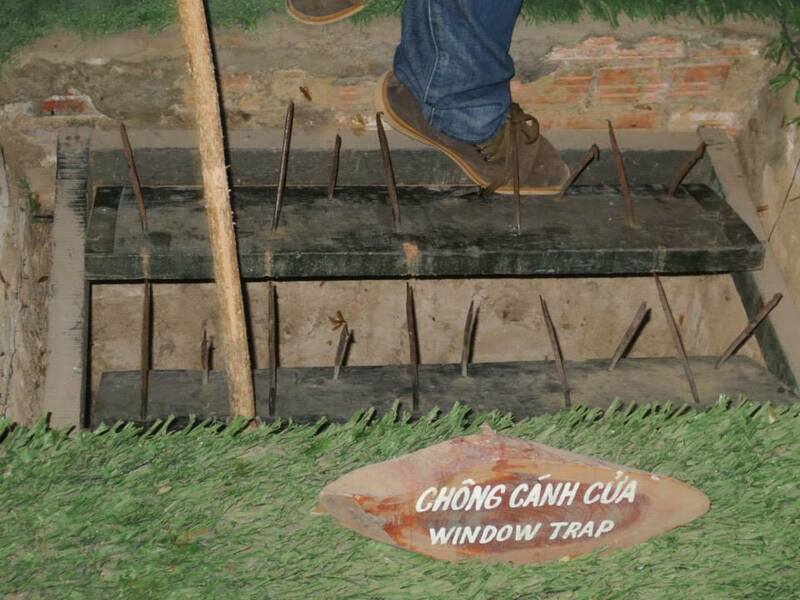 This trap was attached to the doors of local Vietnamese. When the Americans came to search homes they would release it when they opened the door. The paintings in the back there were interesting...and kind of disturbing to me. Sad to think of all the people who died in the forests I was walking through. 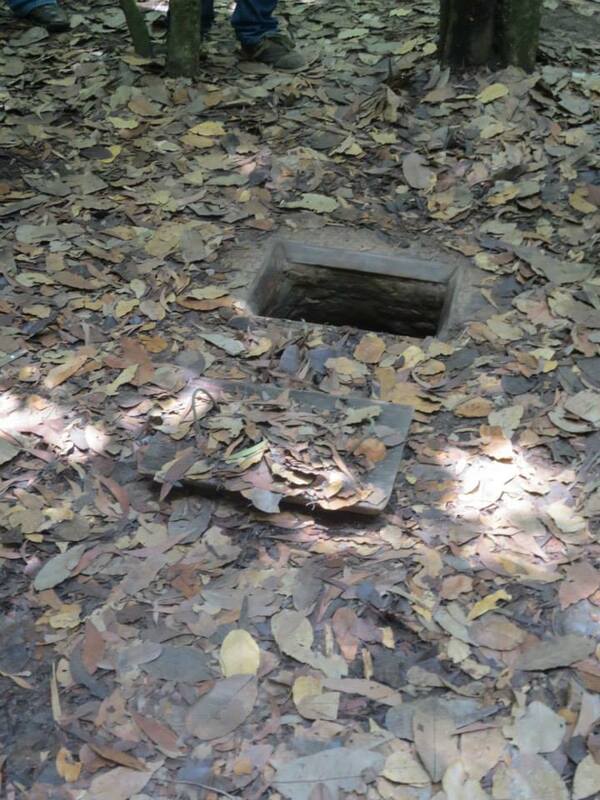 The Vietnamese were also resourceful in other ways--they used old American garbage to throw off dogs looking for their smell, and they also commonly used hot peppers on the trails for this same purpose. 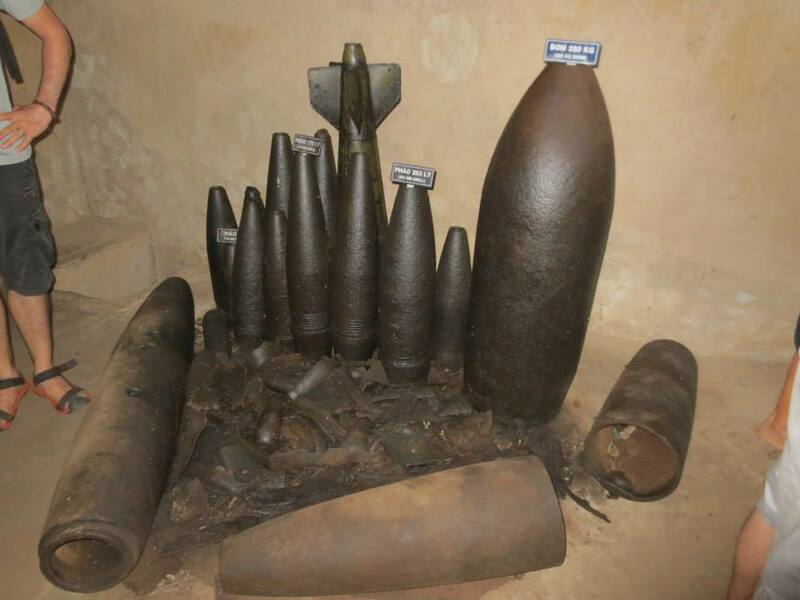 It seemed nothing went unused when it came to the Viet Cong--they even used the shells of old bombs to create tools and weapons. Even the shape of their shoes were made in a way so that when Americans saw their footprints in the sand they wouldn't be able to tell which way they were coming from or where they were going. I was surprised to learn that there were a lot of women who fought in the Vietnam War. 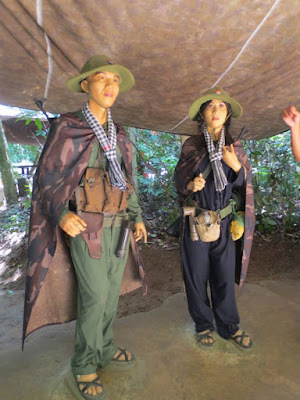 The rubber shoes they're wearing were actually pretty significant...the rubber kind of shoes the Vietnamese had were in most cases much better than the heavy boots the American soldiers had because of the damp jungle conditions, which caused a lot of Americans to develop problems with their feet. They also didn't have the typical curve that most of our shoes have, so when Americans saw footprints it was impossible to know which way they were coming from or where they were going. During the tour there was a part where we were able to go through a small stretch of the tunnels and let me say, it was truly amazing to think that anyone would be able to stay down there for any extended amount of time. The tunnels were so incredibly small and narrow that I had to walk with my legs completely bent, pretty much a squatting position. It was also extremely hot and claustrophobic feeling and we were all glad to get to the end of the tunnel, even though we were only under for a few minutes. At the end of the tour there was a strange point in which people could pay money and shoot off guns. I guess for tourists from outside the US this probably isn't an opportunity that they get often and is therefore a good way to make money, but it was just a strange way for things to wrap up. After learning about all the ways people died in that very jungle, the sound of gunfire in the background was a bit too eerie for my liking. It was about 3:00 by the time we got back to the hostel, at which point I decided to go out and do a little exploring. The part of the city I was in was really chaotic and it didn't take long before I got too lost and a bit overwhelmed with the constant motorbikes buzzing by me. Luckily as I was standing on the side of the road with my map, a British guy I met at the hostel earlier that day came over and asked if I was lost (yes, I was...and he was too) at which point we decided to team up to find a place for dinner. Finally we found a place that suited us and we had a nice dinner before heading back in to the hostel for the night. I wanted to make sure to get some rest before my excursion to the Mekong Delta the next day!